This week, the Samarian Regional Council successfully held a conference with American congressmen in Washington against BDS. 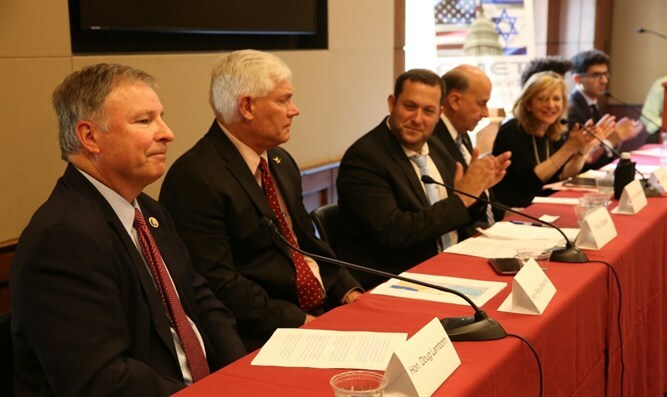 This week, the Samarian Regional Council successfully held a conference with American congressmen in Washington on the subject of support for Samarian communities and the fight against BDS ["boycott, divestment, and sanctions" against Israel]. The conference was the first of its kind. Over 100 people were in attendance of the conference, which was organized with the intent of explaining why BDS is anti-Semitic, absurd, and harms the State of Israel. American congressmen participated in the conference, as did a Palestinian youth from Shechem who asserted that BDS mainly harms Palestinians who enjoy the economic conditions that Israeli businesses in Judea and Samaria bring. The conference was made possible after two years of quiet diplomatic efforts between the Samarian Regional Council and American congressmen, who had been invited to Samaria and became convinced that Jews living in Judea and Samaria do not pose an obstacle to peace – rather, could actually be the key to peace. Congressmen at the conference, such as Colorado Republican Doug Lamborn, spoke out strongly against BDS. "I'm both saddened and enraged by the widespread movement known as BDS […] Many would have liked to believe that anti-Semitism died after World War Two but, unfortunately, anti-Semitism is again rearing its ugly head in the form of BDS," Lamborn said.